In colonial American animal familiars can be seen in the witch hunts that took place in Salem, Massachusetts in 1692. Familiar spirits often appear in the visions of the afflicted girls. Although the 1648 law that defined a witch as one who "hath or consulteth with a familiar spirit" had been suspended ten years earlier, association with a familiar spirit was used in the Salem trials as evidence to convict suspected witches. Sarah Good was said to have a yellow bird who sucked between her fingers. Ann Putnam in particular frequently saw the yellow bird in her afflictions. Tituba was known to have seen strange animals that urged her to hurt children, these included, a hog, a black dog, a red cat, and a black cat. ↑ Wilby 2005, pp. 59-61. ↑ Wilby 2005, p. 61. ↑ Wilby 2005, pp. 74-76. ↑ Chauran, Alexandra (2013). Animal Familiars for Beginners. Jupiter Gardens Press. ISBN 1938257669. ↑ Pierre A. Riffard, Dictionnaire de l’ésotérisme, Paris: Payot, 1983, p. 132; Nouveau dictionnaire de l’ésotérisme, Paris: Payot, 2008, pp. 114-115. ↑ Charles Baudelaire, The Flowers of Evil (1857), “The cat”, 2. ↑ A. P. Elkin, Aboriginal men of high degree. Initiation and Sorcery in the World's Oldest Tradition, 1945, 48. A spiritist medium allegedly loses consciousness and passes under control of some external force (called a “control spirit”), for the supposed transmission of communications from the dead, or messages for an individual or a group. ↑ Mircea Eliade, Shamanism. Archaic Techniques of Ecstasy (1968), Princeton University Press, 2004, 72, quoting Leo Sternberg, Divine Election in Primitive Religion, Congrès International des Américanistes,1924, 476 ff. ↑ Wilby 2005, p. 62. ↑ Willis, Deborah (1995). Malevolent Nurture. New York: Cornell University Press. pp. 32, 52. ↑ Wilby 2005, p. 63. ↑ Wilby 2005, pp. 60-63. ↑ Bane, Theresa. (2012). Encyclopedia of Demons in World Religions and Cultures. Jefferson: McFarland. p. 21. ISBN 978-0-7864-8894-0. ↑ Wilby 2005, p. 60. ↑ Wilby 2005, pp. 60-61. ↑ Wilby 2005, pp. 66-67, 70-71. ↑ Wilby 2005, p. 77. ↑ Wilby 2005, pp. 77-78. ↑ M. A. Murray, Divination by Witches’ Familiars. Man. Vol. 18 June 1918. Pp. 1-3. ↑ William Morgan, Superstition in Medieval and Early Modern Society, Chapter 3. ↑ M. A. Murray, Witches familiars in England. Man, Vol. 18 July 1918, pp. 1-3. ↑ Norton, Mary Beth (2002). In the Devil's Snare: The Salem Witchcraft Crisis of 1692. New York: Vintage Books. pp. 26, 28, 48. ↑ Norton, Mary Beth (2002). In the Devil's Snare. New York: Vintage Books. p. 48. 1 2 Wilby 2005, p. 59. ↑ Times, The (1916). "Superstition in Essex: A Witch and Her Niggets". Folklore. 27: 3. ↑ Murray, Margaret (July 1918). 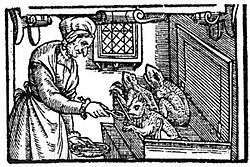 "Witches' Familiars in England". Man. Man, Vol. 18. 18: 101–104. doi:10.2307/2787283. JSTOR 2787283. ↑ Murray, Margaret (1921). The Witch-Cult in Western Europe. London: Oxford University Press. pp. 205–237. ↑ Norton, Mary Beth (2002). In the Devil's Snare. New York: Vintage Books. pp. 26, 28, 48, 55, 64, 80, 140, 148, 158, 200–201, 205.